Here in Portland, we love cyclocross. It's one of the fastest-growing segments of the cycling world, and no wonder—its short courses and rowdy crowds make it an excellent introduction to racing, both for riders and spectators. Every fall, cyclocross talk is constantly in the air here at BikeTiresDirect.com, and everyone's got an opinion about the best tires for the job. Here's a collection of our recommendations. Be aware that if you're planning to participate in any UCI-sanctioned cyclocross races, you'll have to keep your tire width to 33mm or under to be in compliance with their rules! Tubular tires are great for cyclocross racing because they can be run at low pressures with no risk of pinch flatting. The larger contact patch that allows makes for better traction on soft surfaces—and if you hit something sharp unexpectedly, it's often possible to keep riding a flat tubular 'til you can get to your pit bike—something that's not possible when riding clinchers. We carry tubulars made by Clement, Tufo, Challenge, and Vittoria, with treads to carry you through all kinds of conditions. Our favorite for the muddy conditions we often see around here during race season is hands-down the Clement PDX Tubular Cyclocross Tire, named after our local 'cross series. We also like Challenge's classy offerings, which vary from the Challenge Grifo XS 32 Tubular Cyclocross Tire, perfect for dry, hardpacked courses, to the aggressive mud-friendly Challenge Limus Pro Tubular Tire with traditional gum sidewalls. The Challenge Grifo 32 Tubular Cyclocross Tire is a versatile all-'rounder that's ready for anything. We're also happy to recommend the popular Tufo Flexus Primus Tubular Cyclocross Tire from Tufo, which specializes in the manufacture of tubular bicycle tires—they know their stuff. Clincher tires are often preferred by more casual riders and racers who'd rather avoid the mess and fuss of mounting tubular tires or troubleshooting a tubular system. 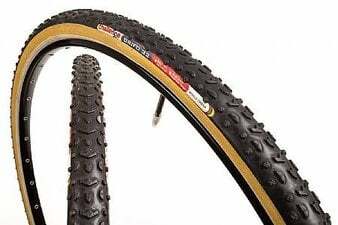 Many of the tubular cyclocross tires we carry are also available as clinchers. Our favorite mud tire, for example, goes clincher with the Clement Crusade PDX Cyclocross Tire. A few riders we know have had great results running the Crusade PDX tubeless with a tubeless-specific wheelset like Stans NoTubes Iron Cross Team Disc Tubeless Wheelset, though they're not technically a tubeless tire. The Michelin Cyclocross Jet Tire is another excellent choice, with a super-fast, grippy tread. Some racers like to use it on their rear tire, with the Michelin Cyclocross Mud 2 Tire in the front for a little extra traction. Of course, cyclocross tires aren't just for racers. Gravel grinders are the next big thing. Looking for an inexpensive, entry-level tire to break into the scene or get some off-road experience? The Kenda K879 Kwick Cyclocross Tire performs admirably in dry conditions and is perfect to transform your road bike into a gravel grinder (as long as you've got enough tire clearance!). 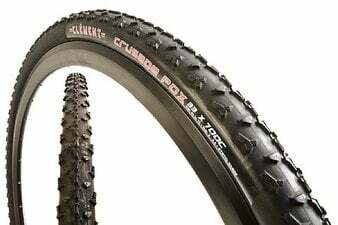 The Clement LAS Cyclocross Tire is also a perfect choice for dry off-road riding, with a short, fast tread at the center of the tire and more aggressive knobs at the sides for cornering confidence. Any questions? We'd love to talk 'cross with you! Give us a call at 1-800-682-0570 or email us at [email protected].